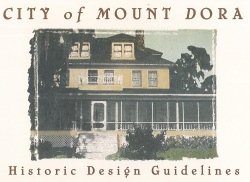 The City of Mount Dora Historic Design Guidelines contains guidelines for repair, restoration, rehabilitation, and maintenance of historic buildings in the City of Mount Dora. The design guidelines identify many of the historic architectural features found on buildings in Mount Dora and describe how to properly maintain, repair, restore, and even alter them so that the building design, materials, and workmanship can be preserved. The book is filled with photographs and illustrations and is written in a format to make it easy to read and understand. The Secretary of the Interior's Standards for Rehabilitation is responsible for establishing standards for all programs under Departmental authority and for advising Federal agencies on the preservation of historic properties listed in or eligible for listing in the National Register of Historic Places. 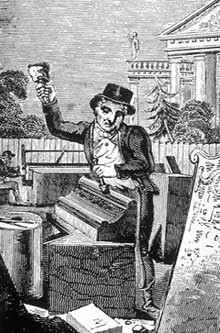 "Rehabilitation" is defined as "the process of returning a property to a state of utility, through repair or alteration, which makes possible an efficient contemporary use while preserving those portions and features of the property which are significant to its historic, architectural, and cultural values." The Standards for Rehabilitation have been widely used over the years--particularly to determine if the rehabilitation qualifies as a Certified Rehabilitation for Federal tax purposes. In addition, the Standards have guided Federal agencies in carrying out their historic preservation responsibilities for properties in Federal ownership or control; and State and local officials in reviewing both Federal and nonfederal rehabilitation proposals. They have also been adopted by historic district and planning commissions across the country. The Craftsman Style was the dominant style for smaller houses built throughout the country during the period from about 1905 until the early 1920s. It originated in southern California and most landmark examples are concentrated there. Like vernacular examples of the contemporaneous Prairie style, it quickly spread throughout the country through pattern books and popular magazines. The style rapidly faded from favor after the mid-1920s; few were built after 1930. Copies of these materials are available at City Hall, 510 N. Baker Street.